West Coast ports in the United States have faced an ongoing battle over the past year to maintain productivity despite high levels of congestion, delays and disruptions. To mitigate these issues, Federal Maritime Commission Chairman Mario Cordero announced this week that the FMC unanimously voted to have Commissioner Rebecca Dye head an engagement project to "work with U.S. international supply chain stakeholders to form supply chain innovation teams that will develop commercial solutions to supply chain challenges and related port congestion concerns." 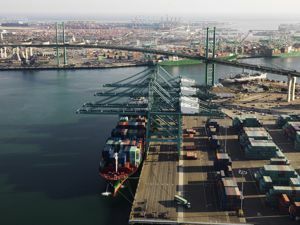 Dye will collaborate with the stakeholders of global supply chains, specifically those within companies linked to the San Pedro Bay ports of Los Angeles and Long Beach, California. Cordero also added that the project intends to identify and address any problems that could threaten future operations and that more details would be released at the FMC's public meeting later this month. The source also revealed that this development is independent of the current analysis of PierPASS's extended terminal gate program being carried out by the Bureau of Trade Analysis. Cordero explained that the issued order to have Commissioner Dye address inefficiencies in the supply chains will contribute to the ongoing efforts being made to "encourage collaborative, innovative supply chain integration." "Their message is clear," Dye said. "We need to assemble a committed team of industry leaders who, by stepping outside of their usual silos, will identify commercial solutions that enhance supply chain effectiveness, reliability, and resilience." She also added that the effectiveness of this project will be dependent on industry leaders' participation and that maintaining privacy throughout the conversations and planning will be important. According to American Shipper, Cordero said in an interview last month that primary goals for the FMC this year are to resolve congestion-related issues affecting ports by collaborating with supply chain stakeholders and to focus on alleviating the negative repercussions experienced from an increase in large container ship vessels. Previous protracted negotiations between shippers and the International Longshore and Warehouse Union had led to detention costs and delays. About 250 of these complaints, which had an accumulative total of approximately $667,000 in fines, were handled by the Consumer Affairs and Dispute Resolution Services office of the FMC. In the FMC announcement, Dye noted that the innovative teams and engagement project intends to build stronger, more resilient supply chains, rather than introduce new regulations.